We are delighted to announce that Study Group are partnering with Widener University to establish an on-campus International Study Center (ISC). This ISC will receive its first cohort of students for the fall 2012 semester. 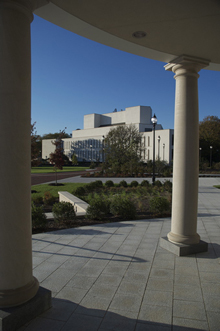 Widener University is a private, metropolitan university that connects curricula to social issues through civic engagement. Dynamic teaching, active scholarship, personal attention, and experiential learning are key components of the Widener experience. Study Group will recruit fully academically qualified international students from around the world and provide a blended program of English language, study skills and academic instruction within the ISC. With a focus on business, engineering and law, the Widener International Study Center will give these talented international students the skills they need for direct entry to their course of choice. Joseph W Cece, Managing Direcor, Higher Education North America, commented "We are proud to announce this new partnership with Widener University which follows upon similar successful programs with James Madison University in Harrisonburg, Va. and Royal Roads University in Victoria, B.C." Through our partnerships with top universities, we are able to provide on and off-campus preparation courses for international students that ensure academic success and entry into some of the most prestigious educational institutions in the world.